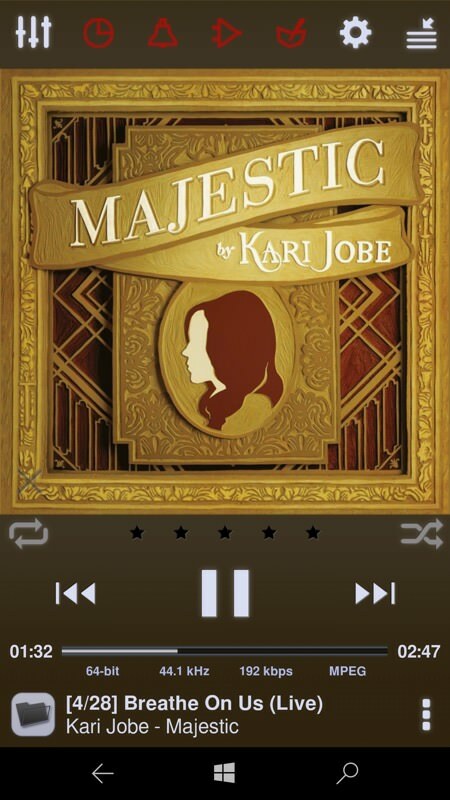 So - why bother with Neutron Music Player? On the desktop, there are ties into network resources which may attract, but under Windows 10 Mobile it's all about audio quality. In short, Neutron has the potential to render your digital music at higher quality and with more enhancements than Groove. But, given the average DAC in the typical Lumia and given the often imperfect nature of compressed (MP3 etc) music, is the extra quality bump gained by completely bypassing the Windows 10 codecs actually audible? In normal playback, i.e. trying to keep the sound neutral and accurate, I have to be honest and say no. Admittedly, my ears are 50+ years old and perhaps I'm not hearing subtleties which the extra (optional) resampling might bring, but for my music, on my Lumia, on my headphones, I couldn't tell the difference, as-is, between the tracks played in Groove Music and then in Neutron Music Player. 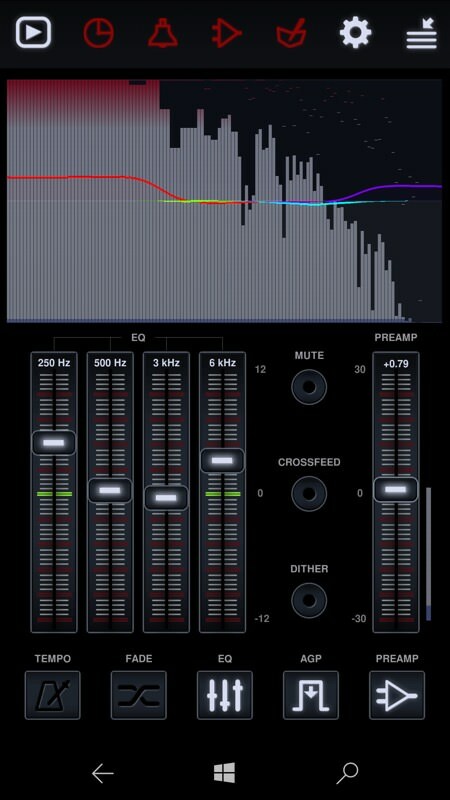 However, when changes are needed to the sound, when you need to go beyond simple EQ - perhaps listening to an older track from the pre-digital age, where extra 'oomph' is needed, or when you need to change the pitch or tempo of the track (DJing at a party or needing something tweaking, then Neutron Player's native DSP engine is able to step in, as I show in some of the screenshots in the review. As I say, half of its diversity is aimed more at the desktop (see the full Store description for a list of desktop connectivity features), but its a full UWP app that's also crafted to work well on mobile - with one possibly major caveat that I'll come to at the end, below. Working through a playlist - you'll have spotted that the UI is very 'custom' - but that's OK as media apps are allowed to look 'interesting', I think? (right) the main playback screen. Note the main UI tabs - some of them toggle between two modes, as you'll see in screenshots below... Note the small fonted info strip below the track progress bar - showing bit depth, sampling frequency, bitrate and encoding. MP1, MP2, MP3, OGG (Vorbis), FLAC, OPUS, WMA, WMA Lossless (16-bit), AC3, AAC, M4A, M4B, M4R, MP4, 3GP, 3G2, MOV, ALAC, APE (Monkey's Audio), WV (WavPack), MPC (MusePack), WAV, AU, AIFF, MPG/MPEG (audio), AVI (audio), iTunes/Windows Media (non DRM), DSD decoding (requires fast CPU, minimally DSD64), DOP (DSD over PCM), DXD, MOD, IM, XM, S3M, Voice audio format: SPEEX. That's impressive, there are some very obscure formats in that long list. I won't pretend my own music collection pushes the boundaries too far - my tracks are mainly .m4a and .mp3, with a few .WAV and .WMA thrown in for good measure. All gathered over the last 20 years, since 'music went digital'! 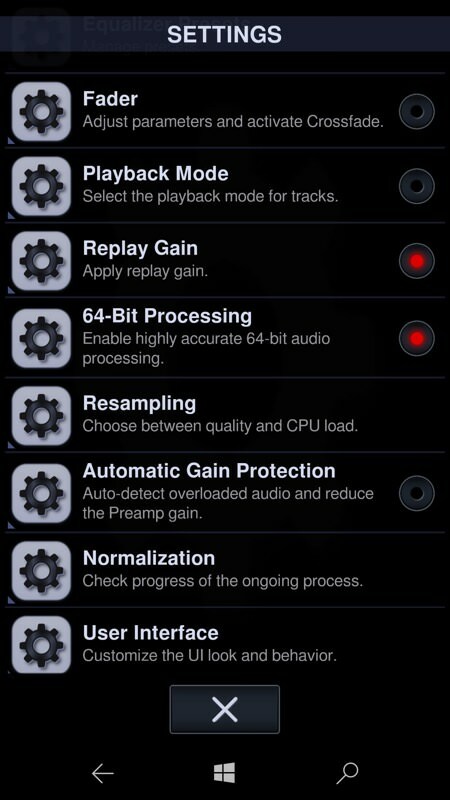 Tapping the top left control switches to the main DSP UI, with real time frequency analyser/visualiser, average signal levels, four channel graphic EQ (toggle-able, on and off), pre-amp gain (ditto), plus various DSP options (also mentioned below); (right) starting off into the extensive Settings dialog, note the LED toggles for Replay Gain and 64-bit resampling - there's a lot to play with. The AGP (Automatic Gain Protection) is a nice idea - if you crank things up too far in the DSP effects then you can set it to keep signals from distorting. A choice of resampling precision? This is getting super geeky! 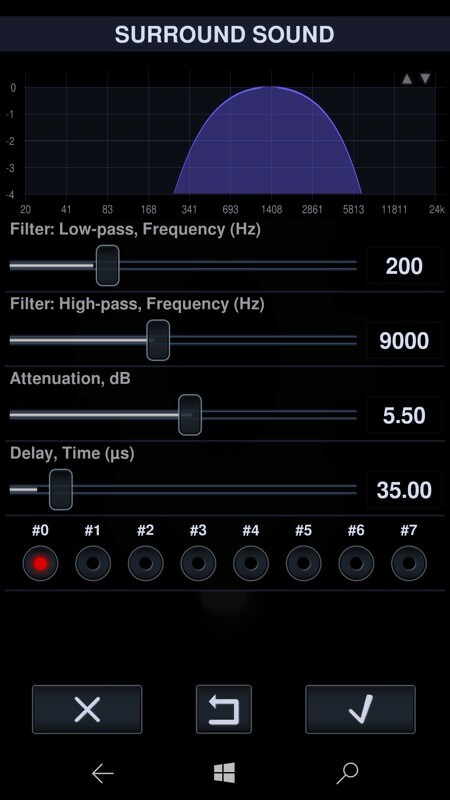 (right) the various DSP toggles and effects. 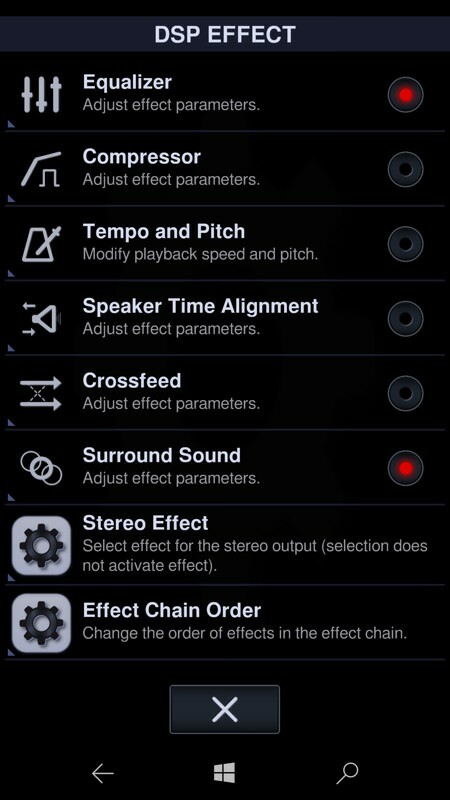 Note the 'Equalizer' master toggle and that Neutron completely replaces the built-in Lumia system Equaliser. 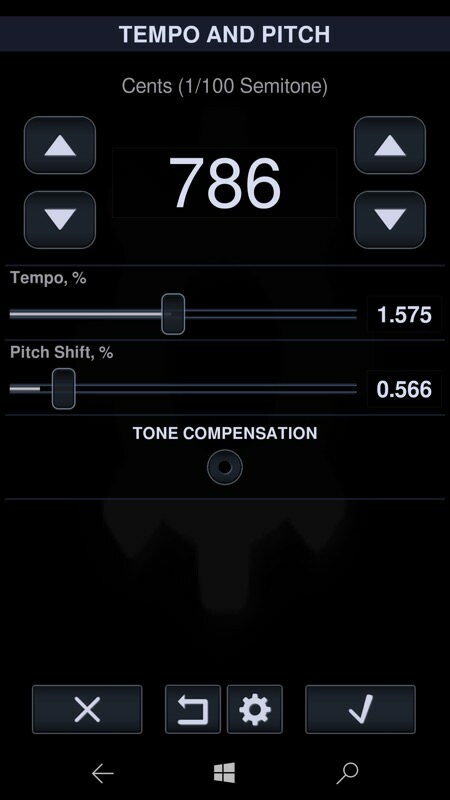 One of the more curious and surprisingly useful digital effects is being able to adjust both tempo and pitch. So they don't have to rise together. Meaning that you can, for example, take a song by an artist and play it 50% faster speed, perhaps for a dance or exercise remix, while keeping the musical pitch the same, so the singer doesn't sound like one of the Chipmunks.... 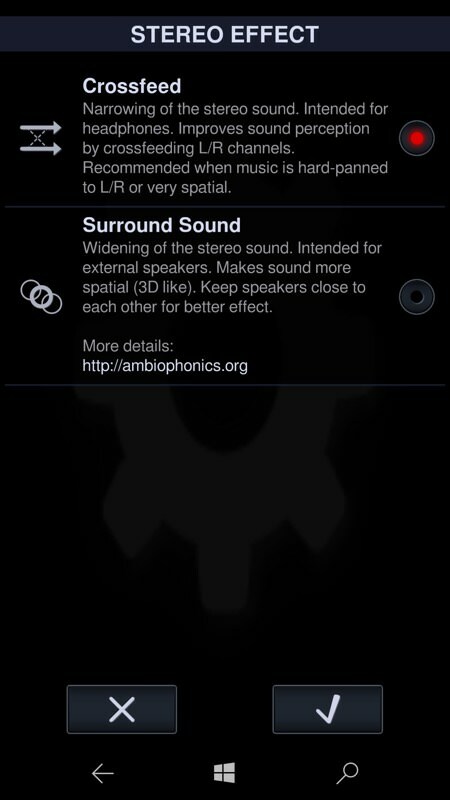 Clever stuff, this digital audio! Before delivering an overall verdict, I have to also deliver a major caveat. On my Lumia 950 XL, Neutron's UI was 95% perfect, with just the odd screen tap missed, usually when activating or deactivating a 'LED' toggle. Not a huge problem - if the tap didn't turn the LED on (or off) then just try again and it always worked on the second try. However, on my Alcatel IDOL 4 Pro (effectively the highest specced Windows phone I own), rather than being more responsive, the UI was far more problematic, with screen taps lost right, left and centre (literally). It does seem as though there are variations in how the touchscreen APIs are implemented on non-Lumia hardware. I've asked the developer to get an Alcatel phone in for testing, in the hope that manufacturer-specific variations can be allowed for - and I'll report back on future updates, of course. Neutron Music Player UWP is a top class piece of coding on the whole though - if the interface looks custom, that's because it is. It's a cross-platform title and the developer has styled the UI to be acceptable on Android and iOS as well. It's a commercial application (about £5? ), but there's a free trial version (for a week or so). it won't shift the needle on Windows until the UI touch issues have been ironed out. it's arguably more niche on Windows 10 than on Android and iOS because Groove Music is such a good default local player already and because the Lumias, at least, all have a good system equaliser and surround effects built-in. 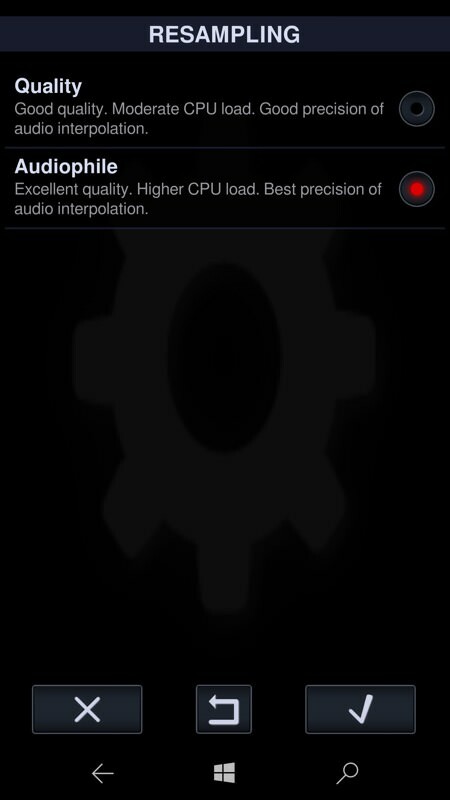 Comments welcome - have you tried Neutron and how did it behave on your smartphone (please specify the device)?